From the snow-capped summit of Mount Kilimanjaro to the vast herds of game grazing on the endless plains of the Serengeti and the game rich Ngorongoro Crater, as well as the sun-kissed beaches of Zanzibar, Tanzania is a land that has an allure for all. Tanzania is probably best known for the Serengeti, site of “The Greatest Show on Earth” where since time began the endless cycle of millions of wildebeest, zebra and other grazing animals crossing the plains in search of fresh grass is a spectacle not to be missed! The vast open savannah always delivers superb game viewing experiences. Ngorongoro Crater, one of the natural wonders of the world, has a huge density of wildlife inhabiting the vast floor of the collapsed caldera. Many Tanzanian safaris of the Northern Circuit will also include a stop at Lake Manyara where (hopefully) you will see the fabled tree climbing lions. The lake and its surrounding regions are also a haven for flamingos, hippo, baboon, impala and a variety of bird species. The lesser visited Southern Circuit encompasses the Selous and Ruaha National Parks. Selous is Africa’s largest game reserve, larger than Denmark! Although the northern circuit is the most visited, venturing off the familiar path inevitably rewards visitors with phenomenal scenery and wildlife experiences. A trip to the southern circuit is a venture into an unexplored and wild Africa. Zanzibar is an archipelago in the Indian Ocean made up of Zanzibar and Pemba Islands, and several islets. 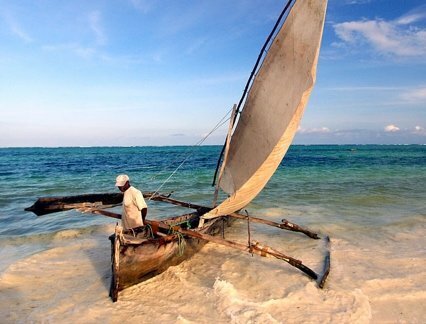 Zanzibar Island is characterised by beautiful sandy beaches with fringing coral reefs, and the old city of Stone Town. Sun soaked white beaches, interspersed with picturesque fishing villages, lapped by the warm turquoise waters of the Indian Ocean provide the perfect place to relax, soak up the sun and take a break after an exhilarating safari. Water sports provide fun for adventure seekers. For a cultural and sightseeing experience visit Stone Town, a place of winding alleyways, bustling bazaars, mosques and exotic Arab houses. Accommodations ranging from comfortable to luxurious suit every budget and style.